Make sure everyone at your next gathering is completely satisfied -including you. Let Scovie's Gourmet Deli take a fresh approach to your catering needs, whether it's an elegant reception, serious business meeting, or casual family picnic. Our enticing offerings include bountiful meat and cheese trays, our famous sandwich trays, colorful fresh fruit trays, fresh vegetable trays, and oh-so-tempting dessert trays. We now have wait staff available to add the finishing touches to your catered event. We charge $20 per hour per waitperson. Tableware, glassware, flatware and linens are available - please ask for pricing. 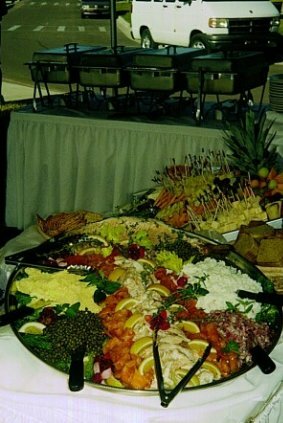 See some catering ideas on the PHOTOS page. Breakfast Beverages: Includes cups, ice, sweetener, & creamer. Includes two deliveries (breakfast & lunch) $25.95 per person. Afternoon break (delivered at lunch time) Assort. cookies, sodas, & waters. Also available to feed larger groups - all salads listed on menu or assortment of deli house made salads (pasta, vegetable, fruit, grains). Call for availability and pricing. Cocktail napkins, small plates, frill pics, and forks are included in the price for catering.